Gasp, cringe, or have a sly chuckle: Rude Britannia will certainly cause a reaction. See politicians brought down to size and the great and the good exposed; blush at the saucy postcards and laugh out loud at the slapstick fun - but watch out for that banana skin! Put together with some the country's best-known cartoonists and comedy writers, this exhibition explores British comic art from the 1600s to the present day. Bringing together a wide array of paintings, sculptures, film and photography, as well as graphic art and comic books, the exhibition celebrates a rich history of cartooning and visual jokes. The room on the Absurd is curated by comedian Harry Hill, and includes such diverse materials as Alice in Wonderland illustrations, David Shrigley's sculpture, and films by Edwina Ashton and Oliver Michaels . Within the Bawdy, Donald McGill's smutty seaside postcards can be seen with works by artists as different as Aubrey Beardsley, Sarah Lucas, and Grayson Perry. 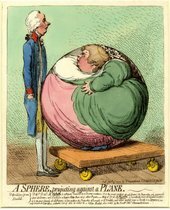 The rooms exploring Politics, Social Satire and Cruikshank's Victorian masterpiece The Worship of Bacchus, have been put together with Gerald Scarfe, Steve Bell, and the cartoonists from Viz. 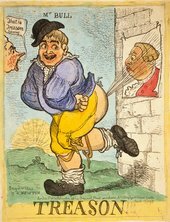 These show the power of comic art as a form of social and political commentary throughout history, from satires of Georgian society by Rowlandson and Gillray to Spitting Image's damning Thatcher puppet. Looking at comedy that is both timeless and of-its-time, Rude Britannia contrasts contemporary artists such as Angus Fairhurst with key historical pieces, and covers everything from Hogarth to the YBAs.